1. Add black beans to medium pot and bring to a boil. Reduce to a simmer. 2. Rinse asparagus and cut of fibrous stems. Cut the asparagus into 1-2" long pieces. 3. Heat a large frying pan on the stove over medium-low heat. Once hot, add asparagus and 1 Tbsp of Pastamore Meyer Lemon Oil. Cook until tender, stirring as needed. Season to taste with red pepper flakes, salt, and black pepper. 4. Drain black beans and return to cooking pot. Add 1/2 tsp garlic powder and mix well. 5. 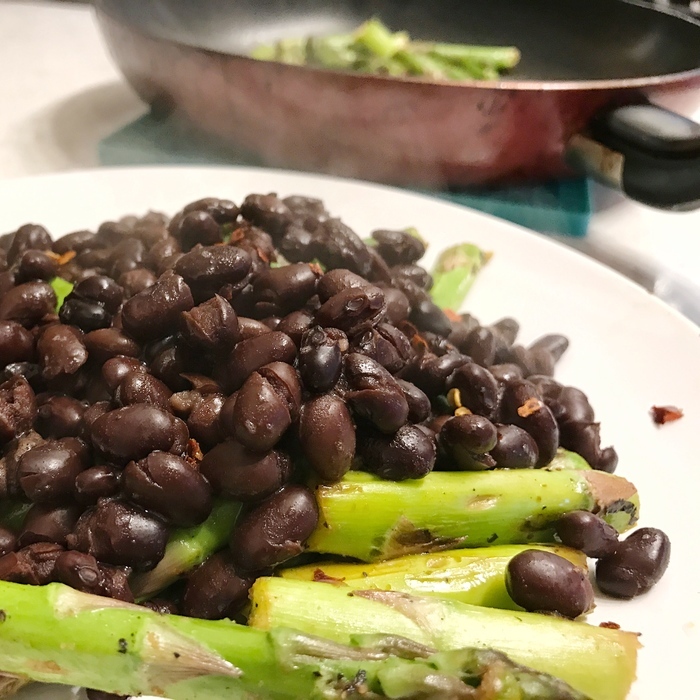 Plate the asparagus and top with the black beans. Finish with a drizzle of Pastamore Meyer Lemon Oil.